Posted on Sun, Feb 26, 2012 : 7:01 a.m.
Manchego cheese toasts and crimson cocktails featuring cranberry and cherry juice, inspired by the Academy Award winning film “Gone With The Wind.” The drink and appetizer make an elegant pairing for an Oscar night cocktail party. Great movies and great food are box office gold, from Forrest Gump's chocolates to "Silence of the Lambs" anti-hero Hannibal Lecter's disturbing pairing suggestion for Chianti. We've put together a selection of drinks and appetizers inspired by five Best Picture Oscar winners to help you get your Academy Award's viewing party rolling. So get ready to settle in with a beverage and a bite when Hollywood celebrates itself on Feb. 26. You've got all the bases covered — lights, camera, (snack) satisfaction. SCARLETT FEVER: "Gone with the Wind"
A starving Scarlett O'Hara resorts to grubbing up radishes in the famous "I'll never be hungry again" scene that ends the first half of "Gone With The Wind." 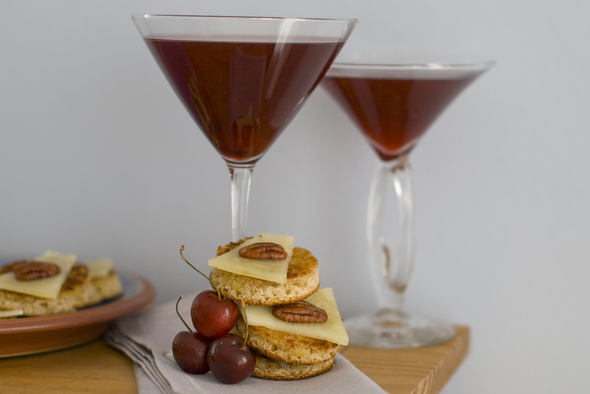 Luckily, you can try something much tastier with this crimson cocktail featuring cranberry and cherry juice. Serve some manchego cheese toasts on the side for an elegant nibble. This appetizer uses banana bread, a food that came into vogue in the 1930s as baking powder and baking soda became staples of the American kitchen. It's not likely you'll have leftovers, but if you do, fiddledeedee! Tomorrow is another day. In a cocktail shaker filled with ice, combine the cranberry juice, cherry juice, vodka and lime juice. Shake and pour into a martini glass. Garnish with fresh cherries. Slice banana bread thinly and cut into 2-inch rounds with a small cookie cutter. In a skillet, melt butter over medium-high. Toast the banana bread rounds in the buttered skillet. Serve topped with slices of manchego cheese and toasted pecans. Makes 24 rounds. Everybody comes to Rick's Cafe Americain in the movie "Casablanca," whether it's for cocktails, eats, forged letters of transit or hopes of winning big at roulette. You'll probably want to stick to the first two, though. Here's a recipe for a spicy whiskey sour that would be right at home in the '40s nightclub scene that serves as the background for "Casablanca's" story of love and war. And if you're looking to gamble on something new, why not try some potato chip cookies, a twist on the traditional snack. We can't guarantee your friends will be shocked — shocked! — but they may be mildly surprised. In a double old fashioned glass, stir together the whiskey, lemon juice, sugar, ginger, turmeric and cinnamon until the sugar is completely dissolved. Add 1 ice cube and top with a splash of seltzer water or club soda. Garnish with a lemon twist. In the bowl of an electric mixer, beat together 1/2 cup unsalted butter with 1 packed cup of brown sugar. Add 1 egg and beat again. Add 2 cups all-purpose flour, 1 teaspoon baking powder, 1 cup finely crushed potato chips, and 1/2 cup sliced almonds. Mix just until combined. Scoop by the teaspoonful onto parchment-lined baking sheets and bake for 10 to 12 minutes at 350 F. Makes 30 cookies. KILLER RECIPE: "Silence of the Lambs"
Anthony Hopkins turned in a twisted but brilliant performance in "The Silence of the Lambs" as Hannibal "the Cannibal" Lecter, the serial killer who boasted of consuming his victims. That's one way to solve the catering issue, but we're going with this much less creepy (not to mention non-criminal) combo of a delicious Chianti spritzer and fava crostini. In a cocktail shaker filled with ice, combine the vodka and chianti. Shake well, then strain into a cocktail glass. Top with seltzer water. Garnish with fresh raspberries. In a large skillet, cook 2 sliced yellow onions in 2 tablespoons of olive oil until soft and brown. Add a 1-pound package frozen fava beans (if you can't find fava beans, use shelled edamame) and cook until soft. Season with salt and pepper. Add the juice of 1/2 lemon and 2 tablespoons of chopped parsley. Roughly mash the mixture. Serve spread on toasted slices of French bread with shavings of Parmesan cheese. Makes 24 crostini. Box of Chocolate Cocktail and Honey Pecan Shrimp, inspired by the Academy Award winning movie "Forrest Gump," in Concord, N.H. 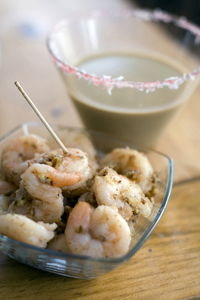 The cocktail and shrimp dish are a perfect pairing for an Oscar night cocktail party. YUM, FORREST, YUM: "Forrest Gump"
The 1994 movie "Forrest Gump" followed the adventures of a goodhearted man of less-than-average intelligence who somehow found himself with a front seat to history, from the evolution of Elvis to the Vietnam war and beyond. Along the way he makes friends with Bubba, a shrimp fisherman who waxes lyrical about the many ways to cook the crustaceans. This recipe calls for a simple baked preparation livened up with chopped pecans. We paired it with a chocolate cocktail commemorating the movie's catchphrase that life is "like a box of chocolates. You never know what you're gonna get." In this case we feel reasonably safe in predicting that you're gonna get a delicious drink. Pour a small amount of grenadine into a small, shallow plate. Sprinkle the coconut on a second small plate. Dip the rim of a martini glass first in the grenadine, then in the coconut to coat the rim of the glass with coconut. Pour the caramel into the bottom of the glass. In a cocktail shaker filled with ice, combine the milk, amaretto and Godiva liqueur. Shake well, then strain into the prepared glass. Arrange 1 pound raw, peeled and deveined shrimp on a lightly oiled baking sheet. Drizzle the shrimp with 3 tablespoons honey. Mix together 1/2 teaspoon salt, 1/4 teaspoon black pepper, 1/4 teaspoon granulated garlic and a pinch of cayenne pepper. Sprinkle over the shrimp. Sprinkle with 1/4 cup finely chopped pecans. Bake at 400F for 10 to 12 minutes, or until the shrimp are cooked through. Serve warm. AN HORS D'OEUVRE THEY CAN'T REFUSE: "The Godfather"
"The Godfather" is a sweeping saga of crime, punishment and the complexity of family ties. But it has its foodie side, too. There's the ominous orange — when one of these appears in the movie expect trouble. There's the scene where Clemenza teaches Michael Corleone how to make gravy (spaghetti sauce) because "you never know, you might have to cook for 20 guys someday." And was there ever sager culinary counsel than this? "Leave the gun; take the cannoli." Here's a cocktail featuring Italian liqueur with a touch of orange to keep things interesting and some meatballs to go with your gravy. In a double old fashioned glass, stir together the Campari, Amaretto, bitters and Scotch. Garnish with an orange twist. In a medium mixing bowl, combine 1/2 pound of loose spicy Italian sausage with 1/2 pound lean ground beef. Form into 1-inch balls. In a large skillet over medium, heat 3 tablespoons of olive oil. Add 4 cloves thinly sliced garlic and saute for 3 minutes. Add the meatballs and cook until browned and cooked through, about 6 to 8 minutes. Used a slotted spoon to transfer the meatballs to a plate. Add 1 teaspoon crushed red pepper flakes, 1 pint halved grape tomatoes and 1/2 cup torn fresh basil leaves to the pan. Saute for 1 minute, then season with salt and pepper. Spoon over the meatballs. Makes 24 meatballs.